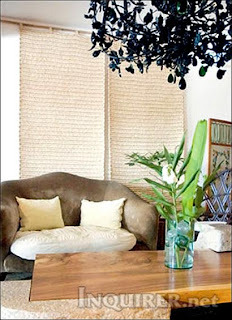 2005 UST Interior Design Graduate Felice Capicoy spills her decorating and designing secrets. There are a lot of ways you can save by doing things yourself. A good example would be when you are house painting. Buy the materials you need, invite a few friends over and ask them to help you paint. It will cost you a fraction of labor costs plus you'll have fun doing it. You can also try making your own home decor by recycling materials or just by presenting everyday items in a more interesting manner. Get the exact dimensions of the place that you are moving into to make sure that the space is utilized to its maximum capacity. Click "Read More" to view the rest of this entry. To avoid clutter, use the two-year rule. If an object hasn't been touched in two years, throw it out. Accessorize! Throw pillows and a centerpiece can make a world of a difference when decorating a space. 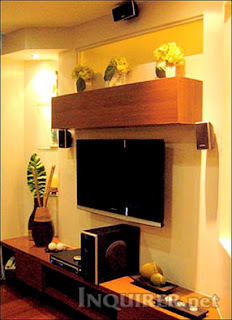 It can add warmth and make your space more inviting. 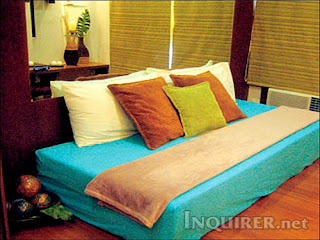 Colors play a big part in making a room. For small spaces, use light-tinted colors to make it seem more open and spacious. Bold colors can be good accents. Don't overdo it by painting all your walls in bloody red. Try experimenting by painting one side with a unique color then complement it with a neutral shade. Sometimes it's easy to fall victim to following trends. Just because Thom Filicia painted his client's wall with a stripe pattern, don't assume that it will look good on your space. Think of how you will respond to it in a few years' time. Will you still like it five years from now? Do not be afraid to ask for professional advice. It won't cost you that much and sometimes it's even free! When looking around for furniture, ask the in-house designer for suggestions in space planning. Before deciding which paint to get, a lot of major hardware chains offer computer-based previews of what that certain shade will look like in a room. Ask for samples that you can take with you like fabric swatches so you can see how it will actually look like in your home. Lighting can be, more often than not, overlooked by home owners when in truth, it can make or break a space. What good is that photograph or artwork if it's illuminated with a fluorescent lamp? Mirrors can make a space look bigger. Vertical lines can make your ceiling seem higher. Horizontal lines can make a space look wider. To save space, a lot of furniture manufacturers nowadays sell multi-functional pieces like sofas that can turn into day beds or ottomans that can double as storage chests.